What we know about them ? In the 1750 - 1850 period Jews in Germany generally, and Bavaria in particular were severely restricted in where they were allowed to live, and how they could earn a living. No Jew could stay in a locality unless they had obtained a specific permit to live there - the so called "Judenmatrikel" - and this listed precisely the members of each family. No name could be added to that list unless someone on the list died. 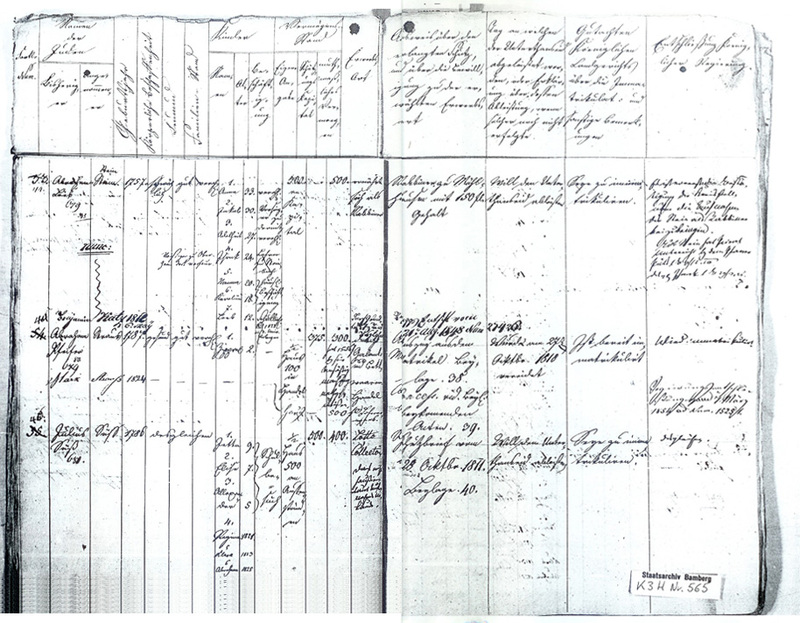 We have got an image of the Judenmatrikel in which Abraham Loeb Stein and his family are listed. Click here for a view of the document . In addition, only the head of the household, and only the oldest son were entitled to work. That was the main reason why Rabbi Leopold STEIN encouraged his cogregants to emigrate to the USA. [source: StAB, K3 H 426 und JLO, Bd. I (1988), S. 79/80. ] - but we have thus far not found any trace of him. 3. Leopold STEIN actively encouraged his congregants to emigrate. Many went to Cincinnati and Baltimore. It seems strange that we have not yet found any member of his direct family who emigrated. We seek any information that may be available on this. His son Louis Leonard was one of them. We have FOUND his descendents! Issaak Stein, now Styne, went to the States as a young man. There, he married a Christian and that was probably the reason why he did no longer exist for his father. He has vanished completely from our horizon. I have now found a [probably unsent] letter from his brother Sigmund Theodor - written in amazing English!!! - but undated. The letter itself is addressed to "My dear sister Emily!" At the end of March, 2008 we have FOUND the descendents of James P Styne married to Emily !